and how effective could it really be?" Well, let me start off by saying that I have long struggled with how to motivate my students to develop positive reading behaviors. Behaviors like persistence, participation, and stamina, are just not yet a part of my students' independent reading toolbox. However, I feel these behaviors help bring about the most success. So, I was very thankful I found Class Dojo. Class Dojo was very easy to start using! Once you create your account, you can start to add 'classes', 'students' and 'groups'. They even provide you with a demo class so you can practice with a "class" that won't be effected by the adding/subtracting of points, or adjusting the points criteria. I suggest you play around the demo class for a little bit before creating your real class. Once you are ready to make your own class(es), just click on the plus sign (similar to creating a new Pinterest board) and follow the prompts. Here is my desktop dashboard with all of the grade levels I work with. 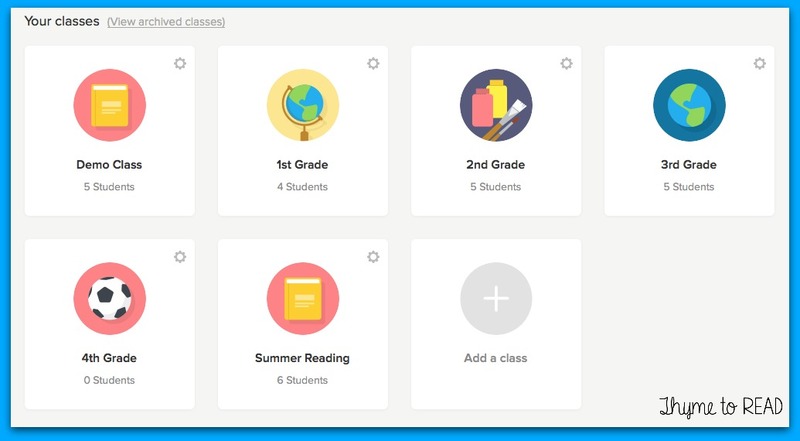 A classroom teacher's dashboard would probably only have one class, but once you click into that class, you could have different groups. I have different groups based on my push-in and pull-out groups. 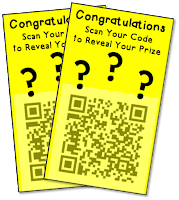 This helps so I can award points to a whole group, rather than just individual students. Here is a picture of my 3rd grade groups. It's really nothing spectacular, but it is a great way to award points when the whole group is working collaboratively and actively working toward group goals. So now that you have your students and groups all set up, you can also adjust your criteria for awarding and deducting points. You can edit this criteria to match whatever your classroom needs are. At first I chose to only reward the positive behaviors, my students could not loose points. I really wanted to encourage my students to start participating and asking questions when they needed clarification. I also wanted to celebrate when my Tier 3 students met their weekly goals. I didn't feel these were points that should be taken away from them, once they were earned! I can also adjust the points value, so if I really wanted to encourage "Strong Reading Stamina", I might bump that up to 3 points for a little bit. Class Dojo has a really fun chime when positive points are awarded, and a really bumming buzzer when points are deducted. I found these to be slightly distracting. If I didn't immediately award points, I would forget to give them out, and then also forget to directly acknowledge the student modeling the positive behaviors. If I gave the points, with the sound on, students wanted to know who it was for and why - my lessons came to a bit of halt so we could talk about the behaviors. Instead, I chose to turn off the volume on my iPad, and when we had a transition, I commented on the students who did a great job and had earned additional points. Problem solved! But wait...there is more to Class Dojo. 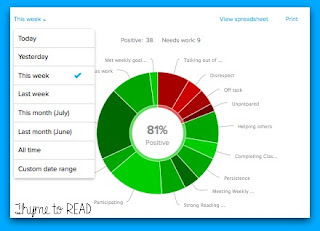 It is not just a behavior management tool...yes, it does get even better! 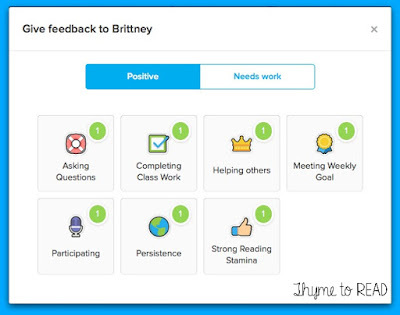 Class Dojo has a parent communication tool. It actually looks quite a bit like a Facebook Wall, and a text messaging app (so it is very user friendly). Families can provide an email or a phone number in order to access their child's account. They can see the points that were awarded (or deducted) that day/week. They have the opportunity to message you (the teacher) privately, that is the text message or email similar portion. I have heard there is a way to set "office hours" so families know when to expect a response, or quiet hours - however I have not found how to set that. Please share in the comments if you have figured out that feature! reminders, pictures, and more. Families can comment publicly and interact with the other families in your classroom. What a great way to build classroom community, beyond the walls of your classroom. If you have been hesitant about starting a class Instagram or Twitter because of the public views, this may be a good place to start, because the only people that can see the account are those that have given you their phone number/email, and YOU have given access by invite. But wait...there is more to Class Dojo. It is not just a behavior management and communication tool...yes, it does get even better! Class Dojo has some pretty fabulous features that allows it to be a great tool for progress monitoring. can monitor how those behaviors are improving over time - you have the option to view various time frames (this week, previous week, this month, previous month). And, with the awesome graph, you can visually see how these behaviors are improving as well. In my classroom, I had a student that was struggling to work independently. I knew that I would be adding and DEDUCTING points for this specific skills, so I created a SECOND avatar for this kiddo. With his classroom teacher, we set a reasonable goal of "Kiddo will be able to work independently for three minutes." After three minutes, I would check in with him to see the work he completed, if he was on-task and the work was satisfactory, he earned a point for meeting his goal. If he was distracted, or did not complete the expected work, points were deducted. He could visually see his progress, percentages were readily available for us to review as well. As a team, we were able to use this data to adjust his goal. Not only did we up the time on task from 3 minutes, to 15 minutes throughout the year, but we also increased his percentage of completion from on task 70% of the time, to 90% of the time. This data tracking would have been so much more difficult without Class Dojo. Just the click of a button allowed for us to have this amazing information available for the student, team and family! 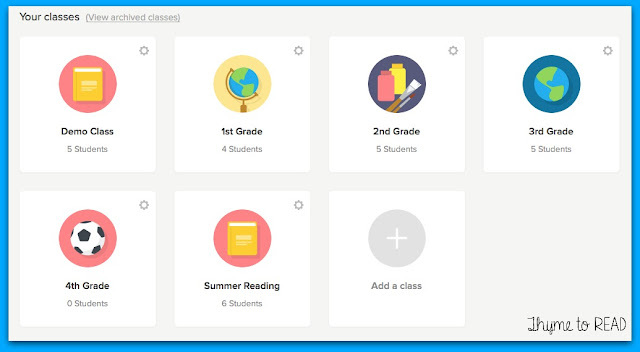 The good news is, Class Dojo is always adding more fabulous features. Just last week, they added student portfolios. I haven't had a ton of time to explore this new feature, but from what I have seen, it looks like the progress monitoring options are only getting better! 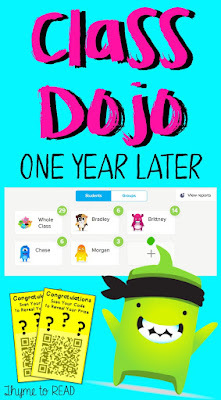 My students had a lot of fun with Class Dojo this school year, and I'll be honest, I did too. During the last month of school, I had a lot of families ask about what they can do over the summer to help their children practice reading. I heard so much about the struggle with getting the kids motivated to read! I think we have all experienced the resistance students have to read. Even if we have worked through that road block in the classroom, when we send these kiddos off on summer vacation, they lack the extensive classroom libraries and guidance we provide them when selecting quality reading material. They miss our encouragement and "hip-hip-hoorays!" I have sent home BINGO boards, summer reading packets...you name it, I've probably sent it home. But sadly, it either doesn't come back, or it comes back incomplete and poorly done. Ugh! So this summer I decided I was going to start a "Book Club" on Class Dojo. I sent home a letter explaining the plan, and asked families to sign up/volunteer their participation. I advertised this book club as a fun way to keep reading. The pressure would be low, but engagement would be high. I explained, I know summers are busy, so it wouldn't be a huge time commitment. With about ten students in my book club, I was pretty pleased with the response. Not shabby for my first year. So what have I been up to with this book club so far this summer? Each Monday (at 11:00 A.M.) an alarm goes off on my phone to remind me to send out my weekly challenge. On the "Class Story" page, I type up a quick check in. You know students love to know about more about us, so I told them we went to the zoo and the lake. I told them Mr. Christensen celebrated his birthday and because he doesn't like cake, I had to make a giant cookie! I usually give a shout out to one of my readers, and encourage everyone to keep going because I LOVE finding out what they are reading. Then I give them their actual challenge. It is different each week, and flexible. Week 4: It was forecasted to be pretty rainy, so I asked them to build a tent and read in it. BONUS: Flashlight Friday - we do this in school sometimes and they love it. We turn off the lights and read with flashlights. To check in, my students/parents send me book titles, reviews, summaries, highlights, hand-drawn pictures, or photos of them reading. Whatever they want to show/tell me about their reading. With all of this, I can be pretty confident that my students read at least ONE book that week. With this summer reading challenge, I have coordinated with a local ice cream shoppe - any student that completes 70% of my challenges, will get a coupon for a free ice cream sundae. However, throughout the school year, I have a different reward system. Just as the point criteria is flexible, I wanted my reward system to be flexible too. 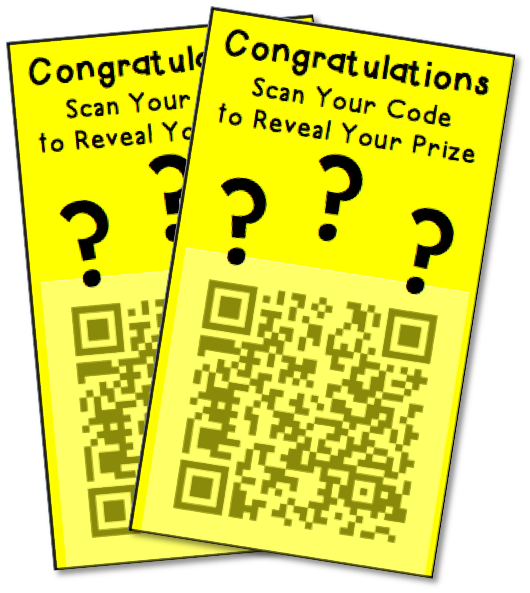 I really didn't want my students to model these essential reading behaviors just because they were going to get rewarded. So I developed a system that could be adjusted throughout the year. On a daily basis, I awarded my students Dojo Points. In the beginning of the year, it was like every minute - we really needed to correct some lax summer habits! As the year progressed, my kiddos needed to work for it a bit more. 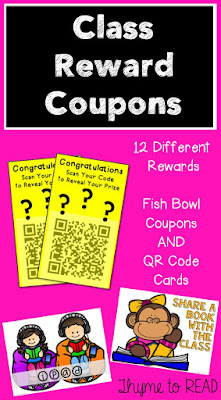 coupon reward cards. Again, throughout the year I 'upped the ante' by increasing the cost of the rewards. My students were completely fine with me upping the stakes throughout the year, they knew to expect the unexpected with me! 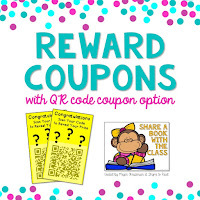 I would reward them "gimme weeks" when I would make the reward cards $1.00 and give points away like crazy (weeks following holidays and vacations so I could re-establish expectations). If you are looking for more information about Class Dojo, here are a few other blog posts you might enjoy! They are filled with more ideas and systems that might work in your classroom. Sixth Grade Tales: A management system that works! 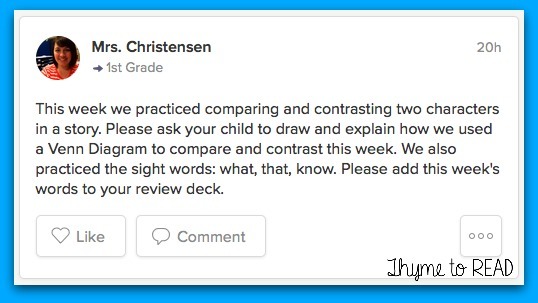 If you use Class Dojo, I welcome you to share your experience in the comments below. If you have a blog post you would like to share, please feel free to drop a link in the comments as well. What is in Your Teacher Survival Kit? I love E V E R Y T H I N G about this post! I too struggle not with actual behavior but encouraging independent/positive reading behaviors. I love the progress monitoring piece - what great data to bring to a team meeting. 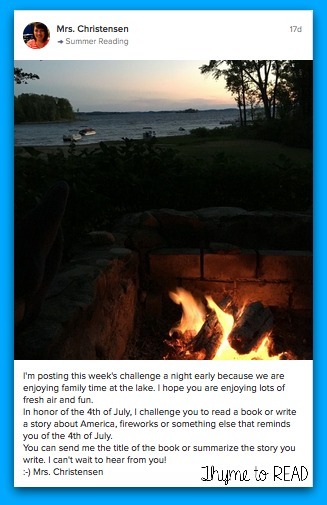 The parent communication piece/summer reading are amazing ideas as well.